The original is still available along with signed prints of “One L-o-o-o-ng Kitty”, cartoon, 9″ x 5.5″ are made in archival inks on various media. It’s a sweet memory of the very first time two formerly feral fosters braved the first floor of the house. Bella and Basil, respectively, are finally having some time on the first floor after thoroughly inspecting the second floor. I still won’t let them in the basement for fear I’ll never find them in the chaos down there, but they weathered their first journey to the new land well. They are each a little timid when it comes to moving into new spaces for the first time, so I’m cautious not to overwhelm them, and my downstairs can be overwhelming. I tell everyone who visits that I am in “full warehouse mode” and stacks of bins and things are everywhere. They did need to be coaxed down by me and Bean, but after a few times of running up and down the steps they were exploring, little by little, sometimes together, most times not, then eventually playing. 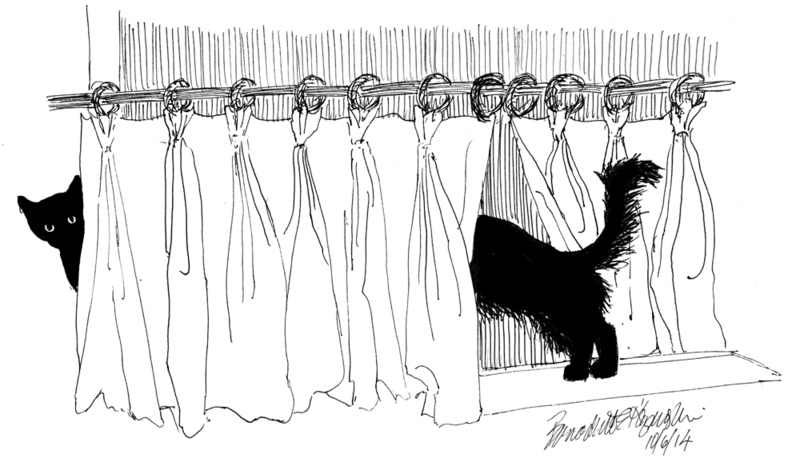 This sketch was awarded a Certificate of Excellence for Cartoons in the Cat Writers’ Association annual Communications Contest in 2015. 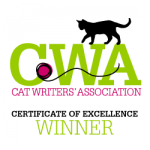 Read more about the Cat Writers’ Association and the awards I’ve won for my writing, art, photography and design. This sketch was framed with 1″ warm white rough finish wood, and a natural white 2-1/2″ top mat with 1/4″ purple bottom mat. Backing is acid-free foam core and the glass premium clear glass. All framing is custom and is done by me in my studio. I can also offer other options for mat and frame if you are interested, please ask. I don’t keep giclee prints in stock for most of my works. Usually I have giclees printed as they are ordered unless I have an exhibit where I’ll be selling a particular print so there is a wait of up to two weeks before receipt of your print to allow for time to print and ship. The giclees have 2″ of white around the outside edges. Digital prints are made on acid-free matte-finish white 100# cover using archival digital inks. While digital prints are not the quality of a giclee in capturing every nuance and detail of color, texture and shading, I am still very pleased with the outcome and usually only I as the artist, could tell where detail and color were not as sharp as the original. The 5″ x 7″ and 8″ x 10″ digital prints are centered on 8.5″ x 11″ digital cover while the 11″ x 14″ has 1″ around the edges because the digital paper is 12″ wide. All are countersigned by me. I usually have at least one of the smaller sizes of canvases on hand, but order larger ones as they are ordered here because customers often want a custom size. Smaller canvases are a 3/4″ in depth, canvases 12 x 16 and larger are 1-1/2″ in depth. I set them up so the image runs from edge to edge, then the sides are black or white or sometimes I slip in a color that coordinates with the painting. This canvas is blue on the sides. I endeavor to do at least a small sketch each day as a warm-up to my aesthetic senses, so I have a small pouch of art materials and a few various sized sketchbooks available in the house and out. Usually, these are done in pencil, my first and favorite medium, though sometimes it’s charcoal, ink, colored pencil, ink and brush, whatever strikes my fancy at the moment, the greatest challenge to keep it quick and not get caught up in details, let the idea flow onto the paper. Most often, the subjects are my cats because they are such willing models, though sometimes I’ll also wander afield, literally, and sketch in my yard or anywhere I go for errands. Medium and especially style vary just so I get a chance to do something new. Every once in a while, they are meant for framing, and I’ve designed a series of notecards, notepaper and notepads using other daily sketches (see my notecards section). Often I use them as illustrations for graphics projects I’m designing. This entry was posted on May 14, 2016 by Bernadette.